The first meeting of Central Asian Expert Forum concluded today in Bukhara, Uzbekistan. The event was co-organized by UNRCCA and the Institute for Strategic Studies under the President of Uzbekistan. The event was opened on 29 October in Tashkent. The goal of the forum was to create a platform for leading Central Asian experts to discuss critical issues of regional development and security, to align the five countries’ positions on the inter-governmental agenda and to elaborate practical proposals and recommendations for the Heads of State of the region as a contribution to the upcoming High-Level Consultative Forum, which will be held in March 2019 in Tashkent, Uzbekistan. At the opening in Tashkent, Ms. Natalia Gherman, Special Representative of the Secretary-General and Head of the United Nations Regional Centre for Preventive Diplomacy for Central Asia (UNRCCA) and the Director of the Institute for Strategic Studies under the President of the Republic of Uzbekistan, Mr. Vladimir Norov both addressed participants. They were joined by heads and representatives of institutes of strategic studies from Kazakhstan, Kyrgyzstan, Tajikistan and Turkmenistan. 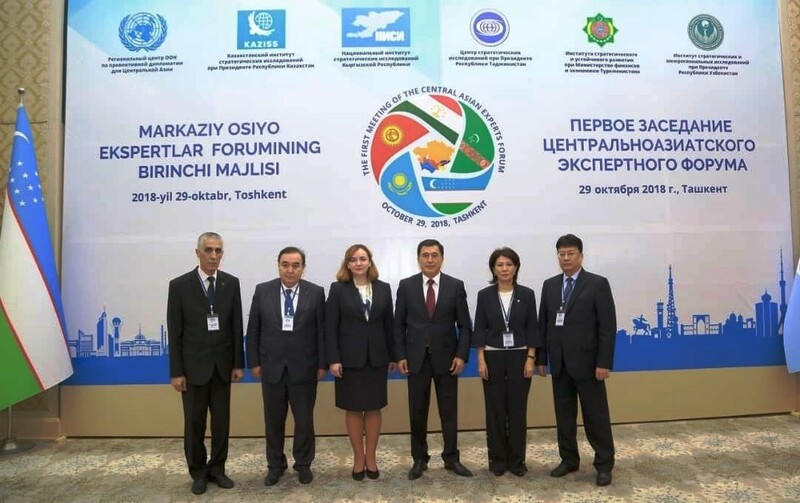 Uzbekistan’s Deputy Minister of Foreign Affairs, Mr. Dilshod Akhatov, also participated in the opening of the forum. Mr. Norov spoke about the growing levels of trust and cooperation among the five countries of Central Asia, describing the current regional environment as a “new paradigm.” He noted that the region’s leaders have shown an “unprecedented readiness” to work together to reduce the possibility of conflict within Central Asia. And he called on representatives of analytical structures to be “in the vanguard” of working to address key issues of security and sustainable development. SRSG Gherman stressed UNRCCA’s role in supporting the five countries of Central Asia in their efforts to deepen regional cooperation and joint approaches to resolving key questions of security, stability and sustainable development. She also spoke about the cultural and historical ties that link that five countries of the region, including the ancient Silk Road and the great Amu and Syr Darya rivers. She noted that improvements in regional relations can help unlock the region’s great economic potential. The Expert Forum included three plenary sessions, covering inter-institutional cooperation in a number of areas, including trade, transport, counter-terrorism, culture and humanitarian issues. The most important outcome of the first Central Asian Expert Forum was the agreement among participants to institutionalize the event to foster greater ties among the five countries’ institutes of strategic studies, including joint research and other joint initiatives. Participants endorsed a concept for the standing platform and rules of procedure to guide their work going forward.